Whether Amazon’s announcement proves that “spiky” talent hubs will Hoover up the lion’s share of future tech jobs like the New Geography of Jobs’ Enrico Moretti would argue, masks the trend of Silicon Valley behemoths increasingly investing in large regional headquarters outside of California as Richard Florida notes, or, per Conor Sen, opens up new opportunities for lower-cost metros, the long-term effect of the Battle for Bezos will be an evolving discussion. As many have reported, Amazon is essentially ramping up hiring and investment at its two biggest East Coast employment hubs, New York City and Northern Virginia – albeit $2 billion richer for their effort. Potentially to demonstrate that it wasn’t a fait accompli, Amazon also announced 5,000 new jobs in a Nashville operations center. No small potatoes but likely scant comfort to regions wondering if aspiring to “Amazon headquarters” status will ever be a realistic ambition. The fact that HQ2 is actually HQ1+1=2 was truly a surprise, mostly because the company’s rhetoric had always been an independent, equal headquarters to complement its home base in Seattle. 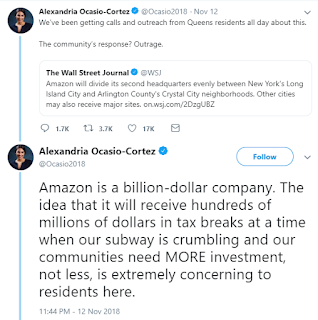 Who knows if the feeding frenzy of proposals would have been as intense if Amazon had more strongly hinted that a split second headquarters was a real possibility. 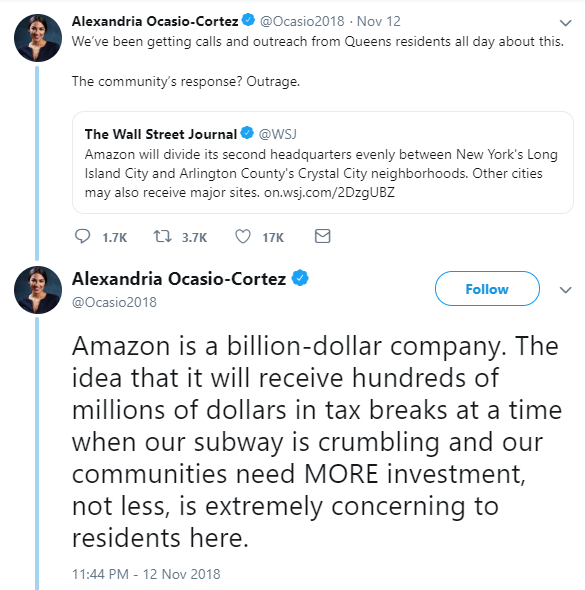 Of course, my belief is that the two-HQ2 contingency became a more logical internal option as anti-Amazon rhetoric began to intensify over the 14-month process. Even the diminished impact of “only” 25,000 jobs on the two selected sites has been a field day for critics. At the very least, a global spotlight has been shone on the economic development machinations of prospect attraction. What that will mean for the future of mega-incentives deals is anyone’s guess. Truth be told, the industry has been moving away from an attraction-centric model for years now as prospect and project flow has declined and the importance of talent has skyrocketed in the dawn of the Fourth Industrial Revolution. Talent was clearly Amazon’s most important selection criterion. Rather than throwing the incentives baby out with the strategic bathwater, the tool should be integrated into a truly holistic growth plan that maximizes a community’s competitive position for companies and talent. This is tricky stuff which, as I can now explain to my family at Thanksgiving with fewer blank stares, is why I still have a job.